4 How to Fill Application Form? The state Government providing financial assistance to Minority students of Karnataka State for pursuing higher studies abroad in Master Degree. Ph.D and Post Doctoral Courses etc., in prestigious Foreign Universities. 1. For Post Doctoral : Candidates should have scored 60% and above marks or equivalent grade in relevant Master Degree/Ph.d. 2. For Ph.d : Candidates should have scored 60% and above marks or equivalent grade in relevant Master Degree. 3. For Master Degree : Candidates should have scored 60% and above marks or equivalent grade in relevant Bachelor Degree. 4. The student must be a domicile of Karnataka. A total Scholarship of Rs.10.00 lakh per annum and a maximum of Rs.20.00 lakh (for 2 years) for the entire course will be sanctioned to the candidates whose total income of the parents should not exceed Rs.6.00 lakhs per annum & between Rs. 6.00 lakhs per annum to Rs 15.00 Lakhs per annum they are eligible for 50% of the Scholarship subject to a maximum of Rs. 5.00 lakhs per annum. Please follow the below steps to apply for the National Overseas Scholarship For Minority Community Students. Step 1 : Go to the official website of Karnataka Directorate of Minorities provided above. 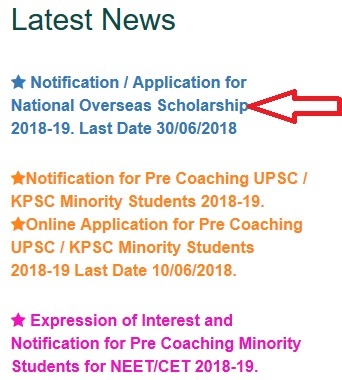 Step 2 : Then click ‘Application for National Overseas Scholarship’ link under the ‘Latest News’ section. Step 3 : Application Form will be displayed in a PDF Format. Read the instructions carefully and fill the Application Form. 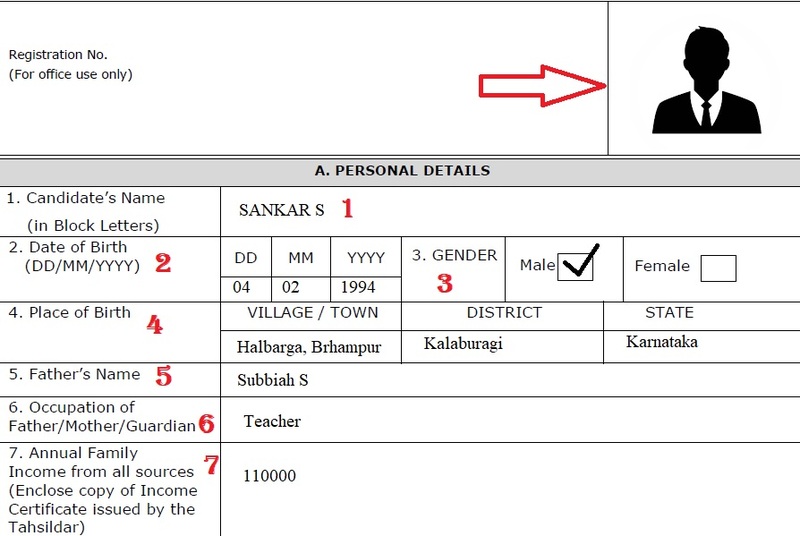 You can also directly download the Application Form from below mentioned ‘NOS Application 2018-19’ PDF. Step 4 : After that, Fill your Personal Details, Particulars Of Academic / Educational Qualification, Details Of Overseas University and Employment History. Step 5 : Accept the declaration, Provide your Signature in the Application Form and Sent the Application Form to the following address on or before the last date. Kindly write “NATIONAL OVERSEAS SCHOLARSHIP FOR MINORITIES 2018-19” on the Envelope before sending it to the Directorate of Minorities, Bangalore-01. 1. Copy of Income and Caste Certificate Issued by the Tahsildar for the current year. 2. Copy of Income Tax Returns (Latest), If your Income Tax Payee. 3. Attested Copy of Degree Certificate (Convocation Certificate). 4. Attested Copies of SSLC Mark Card, I & II PUC Marks Card, All marks cards of entire degree course / Previous examination, all semesters. 5. Attested copy of currently valid Indian passport. 6. Attested copy of visa (if available). 7. Change of University if any by the candidate after counselling by High power Committee will not be considered / entertained and only in Genuine cases with the permission and approval by the Government. 8. Copy of Admission/ offer letter from university/College where admission has been obtained, if offer Letter is not submitted along with application, it will be rejected at the scrutiny level and no further Review will be entertained. 9. Copy of details of course fees and fees break-up of course to which you are selected. 11. Personnel statement of the candidate presenting his/ her case for scholarship (Not more than 2 pages). 12. 1st recommendation / reference letter – academic. 13. 2nd recommendation / reference letter – in case of currently employed applicants, it has to be from a professional, preferably his/ her superiors, else it can be academic (Not more than 2 pages on A4 size). The candidates shall obtain the required admission letter from the Foreign University prior to the application made to the Directorate of Minorities, Bangalore-01. The candidates will be selected in pursuance of the guidelines followed by an interview by the selection Committee of short listed candidates. Not more than one child of the same parent/Guardian will be eligible and to this effect a self certification will be required from the candidate. For Further information and conditions, the candidates are advised to visit the official website of Directorate of Minorities, Bangalore. When will KAS/IAS pre-coaching entrance exam notification be announced? I am from Bangalore and doing B.Ed and I have not applied for minorities scholarship because my classes started on December 10th so last date was in the month of November so I couldn’t apply and will I be able to get scholarship this year and next year in B.Ed? Tell about the renewal status, I really in need of scholarship. I am studying 2nd year PCBSC and we will get our result in this month, now the dates are closed. How do I apply for this scholarship? Please help me with it. I would like to know, how many lists will be published. So far, for 2018-19 first and second lists are published. Will there be more lists? I think there will be only 2 lists. Kindly contact Directorate of Minorities for more Info. Hey! did you check how many lists are to be published? I am doing DELED 2018-19. Can I apply for this scholarship? I am a DELED student. What is the last date of DELED scholarship 2018-19 application? I want to apply for DELED scholarship. Please provide a link. I WANT TO APPLY FOR DELED SCHOLARSHIP. PLEASE PROVIDE THE LINK. I was told that amount will be credited to my daughter account after 15 days now it’s already one month after counseling. How long will it actually take for the amount to credit? Please tell. We are Muslim and my daughter scored more than 80% in PUC and currently enrolled in Civil Engineer Course in Bangalore. Would you kindly let me know, is she eligible for Post Matric Scholarships, if so what is the criteria. I got 92% in PUC science but I have not registered for scheme of minorities, now what to do? I have applied for the Overseas National Scholarship for the year 2018. When will you announced the result? I have no money to pay my college fees, so, I need help, Please help me. I have not received the scholarship from National Scholarship Portal 2.0 welfare department of Karnataka. My online Application ID is KA201718001514112 please, kindly help me to get the scholarship as early as possible. Kindly reply, when will the list for national overseas scholarship for minority Christians be out. Please tell me the last date for abroad studies scholarship for minority community for 2018-2019. I had applied for Post Matric Scholarship and I got my name in the sanction list but still the amount has not been transferred to my bank account. My application ID is KA201718000755293. I have no money to pay my college fees. So, I need help. Please help me. I have not received the minority scholarship yet, Now I am pursuing B.Com 3rd semester. I have not received the scholarship from the minority welfare department of Karnataka. My online application ID is KA201617004628966. Please, kindly help me to get the scholarship as early as possible. Minority means which will include and can a B.E student apply for this? I missed the last date to apply for overseas scholarship 2018. Is there any other possible way to apply for the same? I want to know, when you call for interview, on which date? I want to know, whether this scholarship is applicable for 10 passed students. 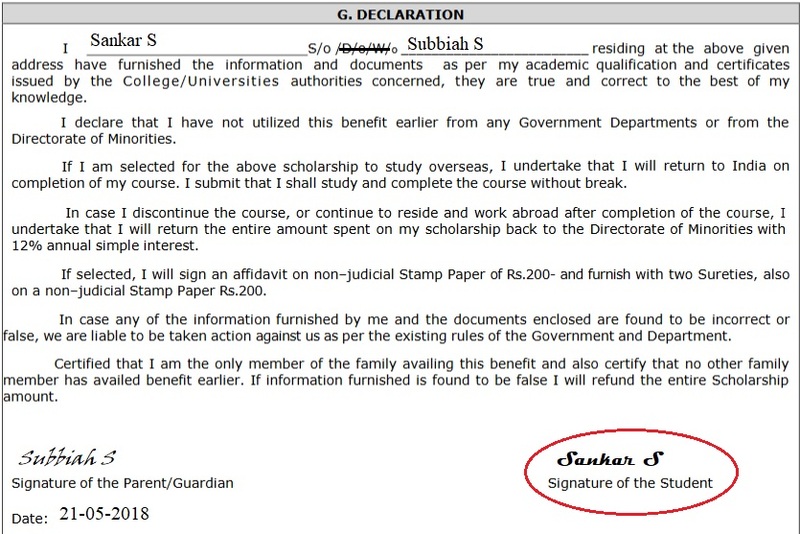 Please clarify, can B.Sc student apply for this scholarship? I have completed my Masters in Hospital Administration in 2015 from RGUHS Bangalore and have 2 years work experience. Now I am interested to pursue Masters in Healthcare Quality which is a specialisation of Hospital Administration. So am I eligible to apply for this scholarship? Is this scholarship applicable for January intake? I am studying Diploma in Engineering, how to apply for Vidyasiri Yojanain scholarship. I am doing MBA. Can I get this scholarship? Let me know, when will the scholarship be open? I want to know, can B.Sc students apply for this scholarship? I want to know, is this scholarship applicable for 12th PU students? Yes, you can apply for Scholarship.